Display / tester product, no retail packaging. For use with body treatments to personalise them. Calla Distribution Ltd are the ultimate beauty professionals providing the beauty industry with the highest quality beauty therapy products and services. We are not only distributors for only the best skin care brands around and have exclusive rights to most of the great brand we stock, but we also offer unlimited support and advice to every customer, no matter how big or small. 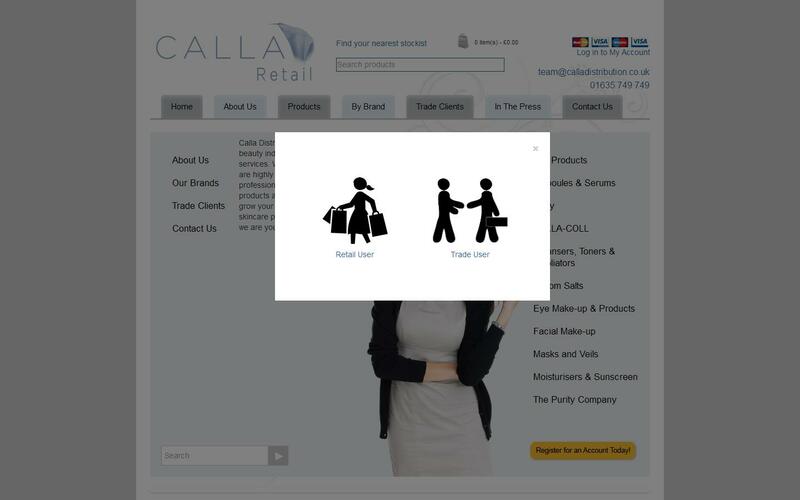 Calla gives you the complete freedom to order what you want, when you want it and we aim to get your items to you within the next working day. Not only are Calla distributors of well respected brands, they have also developed the incredible Calla-Coll collagen supplement that has proved to be a big hit with beauty professionals. After years of work, this incredible product not only tackles the tell-tale signs of ageing, it also promotes the health of the skin, hair, nails and joints. Calla Distribution are also providers of education courses and masterclasses to keep you ahead of your game at all times and helping you to deliver effective treatments to clients. We are dedicated to providing you with you a unique personalised service and support throughout your experience with us. Calla Distribution take the time to get to know each one of clients and their salons so we can provide you with exactly what you need. Calla offer a range of products from your favourite brands including Blinc, Cozmetic Lab, Magis, Novita, Swissdermyl and Calla-Coll. Advertising and promotional by Blinc, Swissdermyl & Calla-Coll –Posters, Leaflets, Bags, Badges etc. Ampoules, Masks, Collagen Veils & Serums by Swissdermyl & Novita– A very important part of a Swissdermyl facial. Can be used both in the salon and at home. We have a serum to suit all skin problems. Body by Swissdermyl & Cozmetic Lab– Masks, Peels, Massage Cream, Oil etc. Collagen Supplement by Calla-Coll – A daily drink that boosts skin, hair, nails and joints. Cosmetics by Blinc & Cozmetic Lab - Eyeliners, Blushers, Eyeshadows, Foundation, Creams, Mascaras. Magis Nail wraps - making gel enhancements super easy to remove. Skin Peels by Novita - revealing the true beauty of your skin. Balancing serum - NO BOX! For many, fighting the signs of ageing or improving the health of skin is an ongoing battle that can’t always be won. So, is Calla-Coll the new tool to help? Since I reached my thirties I have started to notice lines are appearing on my face more frequently and are getting deeper, the fat around my middle is harder to shift and I generally just look and feel older. One of the most in demand products in the beauty market at the moment is micellar water, and now you can add a professional version of this high street favourite to your range. Every therapist wants to find the perfect massage medium, and now Swissdermyl has come up with a natural version that will create the sweetest treatments. In any walk of life, a tailor-made product is a sign of quality and exclusivity, and skincare is no different. In the world of skincare it is easy to overlook body products in favour of lucrative facial treatments, but with Swissdermyl you can offer the same prescriptive care for the body as you do for the face. For many of us, the thought of putting oil on our skin makes us recoil in horror, but with the help of Swissdermyl there are now a range of fantastic facial oils to treat and soothe winter skin. Beauty therapists become accustomed to treating every type of skin, so it is important to make sure you have the tools to do this. When you offer a skincare treatment you will find a good proportion of your clients want you to perform miracles. Thanks to Swissdermyl, you can! When offering a skincare treatment on the face or body it is important to provide a specialised service, and the best way to do this is by stocking a range of specialised skincare. Winter may bring us beautiful scenes of snow covered vistas, twinkling lights and chestnuts roasting on an open fire, but it is not so magical for our skin. As a salon owner you are a professional in the world of beauty, but do you know what to do in the case of a medical emergency in your salon? If the answer to that is no, then you and your staff need to take part in an Emergency First Responder Course.